8 of 15 Khagans of the Mongol Empire. 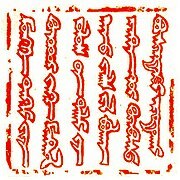 This is a list of Mongol rulers. The list of states is chronological but follows the development of different dynasties. With the establishment of the Great Yuan in 1271, the Kublaids became emperors of the Great Yuan, who were considered as Khagan for the Mongols and Huangdi (Chinese emperor) for native Chinese. Urus Khan (1376–1378), Urus was also Khan of the White Horde and uncle of Toqtamish, allowing the Hordes to unite. This Horde was annexed by Abu’l-Khayr Khan of the Shaybanids in 1446. Actual rulers of the Golden Horde (Jochid Ulus, Kipchak Khanate) were members of the House of Batu until 1361. After the murder of Arpa, the regional states established during the disintegration of the Ilkhanate raised their own candidates as claimants. The Chagatai Khanate is split into two parts, western and eastern. From 1370 on, the Chagatai Khans were puppets of Timur. – Batmunkh Dayan Khaan /1464–1543/, 29th Great Khan and descendant of Genghis Khan (1162–1227) through Kubilai Khan. – Gersenz Jalair Khuntaij /1513–1549/, youngest son of Dayan Khan through Queen Samar Ghailu (also called Jimsgene Khatan). – Amindural /1550/, fourth son of Gersenz, ruled northern Kerulen river area. – Morbuim Taij, son of Amindural. – Khar Zagal /until 1627/, son of Morbuim, ruled until 1627. 1. Sholoi /1627–1652/, son of Morbuim, succeeded his brother Khar Zagal in 1627. First with the title of Setsen Khan. 2. Babu /1652–1683/, fifth son of Sholoi. 3. Norov /1683–1701/, third son of Babu. 5. Omokhei /Sonomdorj/ /1701–1709/, was only 10 years old in 1701, so was brought up under the tutelage of Namjil Erdene Taij, a grandson of Sholoi. 6. Gunchin /1709–1728/, eldest son of Omokhei. 7. Tsevdenbainjuur /1728–1733/, eldest son of Gunchin. 8. Choijav /1733–1735/, grandson of Norov. 9. Damiran/1735–1751/, second son of Gunchin. 10. Manibadar /1751–1767/, eldest son of Damiran. 11. Tsevdenjav /1767–1788/, second son of Damiran. 12. Tseveendorj /1788–1795/, eldest son of Tsevdenjav. 13. Puntsagdorj /1795/, only son of Tseveendorj. 14. Sanzaidorj /1796–1800/, second generation grandson of Choijav. 15. Mahashiri /1800–1807/, paternal uncle of Puntsagdorj. 16. Enkhtor /1807–1816/, son of Mahashiri. 17. Artased/1817–1874/, son of Enkhtor. 18. Tserendorj /1874–1893/, son of Artased. 19. Demchigdorj /1893–1909/, eldest son of Tserendorj. 20. Navaanneren /1910–1922/, eldest son of Tserendondov, who was the son of Orjinjav the son of Artased. Bogd Khan (1911–1924) – Era name: Olnoo Örgögdsön (1911–1924); (the 8th Jebtsundamba Khutuktu) – Tibetan Spiritual head of Mongolian’s Geluk Sect.